Picking wedding-day music seems like an overwhelming task, but with a little guidance, it can be a fun bonding experience for you and your partner. 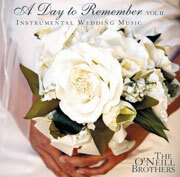 To help with this task, The O'Neill Brothers of New Prague have released A Day to Remember, Volume II, a disk packed with ceremony and reception music most requested by brides themselves. The tracks are organized according to the various parts of a typical wedding day, including prelude, processional, ceremony and reception pieces by famed composers Wagner, Purcell, Handle, Kenny G and more. Pick up The O'Neill Brothers' music at area Best Buy and Borders stores, independent gift shops and online at wedding and music sites, including Amazon and iTunes. Visit www.pianobrothers.com for a complete list of retailers.